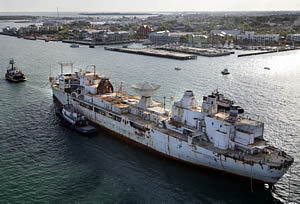 KEY WEST, Florida -- Following an 1,100-mile voyage and more than a decade of planning and acquiring funding resources, the Florida Keys newest artificial reef, the ex-military missile tracking ship Gen. Hoyt S. Vandenberg arrived in Key West Wednesday. The Vandenberg is docked behind the USS Mohawk, a historic Coast Guard ship open as a floating museum, at the East Quay Wall in Truman Annex Harbor. "We're all pretty excited here in Key West and particularly in view of the fact this is going to be the second largest artificial reef in the world," said Key West City Commissioner Bill Verge, who is serving as a project liaison between the city and various state and federal agencies. Final preparations to sink the ship is beginning today. Project organizers said the scuttling should take place sometime between May 20 and June 1, about six miles south of Key West in 140 feet of wather in the Florida Keys National Marine Sanctuary. That work primarily involves the cutting of hundreds of large holes on the ship's decks and sides to help ensure the vessel sinks in an upright position. Seventy percent of the $8.6 million project's funding resources and some 75,000 man-hours were required to rid the vessel of contaminants with that work executed in two Norfolk, Va., shipyards. Pollutants removed include 71 cubic yards of asbestos, 193 tons of materials that contained potentially carcinogenic substances, 46 tons of refuse, 300 pounds of mercury-containing materials and 185 55-gallon drums of paint chips, officials said. The ship first saw duty as a U.S. Army troop transport named the General Harry Taylor. It became the Gen. Hoyt S. Vandenberg in 1963 and tracked the U.S. space program's launches off Cape Canaveral. It also served in the Pacific monitoring U.S. defense missile test launches and eaves dropped on Russian missile launches during the Cold War. 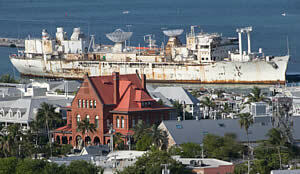 Port Canaveral, Fla., was the Vandenberg's last active duty home port beginning in 1976. The Vandenberg was formally retired in 1983 and was transferred to the James River Naval Reserve Fleet. But, according to Patrick J. Utecht, who managed the ship's electronic systems, a team of six technicians would visit Vandenberg every six months to power up all shipboard electronics and make any necessary repairs. Despite the state of readiness, the ship was never used again and in 1993, was formally struck from the naval register and transferred to the Maritime Administration. The ship received its most public exposure when cast as a Russian science ship in "Virus," a 1999 motion picture starring Jamie Lee Curtis, William Baldwin and Donald Sutherland. The project is being funded by Monroe County, the Florida Governor's Office of Tourism, Trade and Economic Development; City of Key West, U.S. Maritime Administration, Florida Fish and Wildlife Conservation Commission, Florida Keys & Key West tourism council, the National Oceanic and Atmospheric Administration as well as industry and private donations. Banks that provided loans include First State Bank of the Florida Keys, BB&T and Orion. "One of the big products that we make here is happy vacations," said Joe Weatherby who conceived the project some 13 years ago. "And we feel that this artificial reef is the world's best product ever produced for scuba diving. People are going to come from all over the world to dive this, but this product also has been designed so we can offer it to glass bottom boat riders, snorkelers or new divers as well as advanced divers, it hold interest for all of them." This artificial reef would be much more accessible to recreational divers if it was sunk shallower than 140 feet. It does not appear to be appropriate for new divers at all due to the depth, so it really should not be marketed as such. The recommended depth limit for open water divers is 60 feet; for Advanced Divers it is 100 feet; and for those with a Deep Specialty it is 130 feet. Anything beyond 130 feet is beyond Recreational Limits, and is therefore beyond most divers training. It is certainly not for new divers! The ship may actually sit in 140' of water but will rise much higher wherin recreational divers will be able to safely dive the super structure and other main areas at shallower depths. Ayisha would be correct if the ship was only 10ft tall or if divers could only sink to the bottom. Since the ship is well over 100ft tall at many points, and buoyancy control exists, it should be an amazing dive for anyone whether you wish to explore its lower hull at 140' or cruise around its upper works at 20'. Ayisha and Tim, I'm afraid Vic is right. First, the ship has to be sunk deep enough so that it does not create a navigational hazard. If it's not, the Navy will drag or blast it to eliminate the hazard, which won't do the wreck any good. If Vandenber is sunk in 140' of water, the top of the superstructure will probably rise to 60' or so, and the main deck will probably be in the 80-90' range. This is quite similar to the Algol off the NJ coast, where it is 145' or so to the sand. But the Algol's bridge is at about 75' and it's only about 100' to the main deck. If the currents are light and the water is not to dark or hazy, this should be a perfectly manageable AOW dive from a depth standpoint. It's also worth noting that you will need *many* dives to see a ship the size of the Vandenberg within no-deco limits (first dive total bottom time 14 minutes, second dive TBT 11 minutes after a 1-hour SI on air per V-planner; longer with Nitrox) even if you never go below the main deck. Ships are BIG and there will be lots to see. However, any wreck presents certain hazards (such as entanglement from fishing line and nets) and you should consider some more training than OW or AOW before diving on one. I agree with Tim and Ayisha, 140ft is too deep. How can this be in a hazard in National Marine Sanctuary? Here in Hawaii, my favorite dives are shallow and BRIGHT....30-40ft, my favorite wreck is the St. Anthony at 60 ft MAX....so come on over you two .....our water is clear to 100ft or more. The wreck needs to be sunk that deep for many reasons. Hazard to navigation and stability are the 2 main factors. To sink it any shallower would result in having to blast it down to a minimum clearance anyway. Even though it is a marine sanctuary there is still boat traffic over the top of it. The stability in a storm event is also key as many wrecks can be severly damaged in hurricane events. There is always the posibility of getting a guided dive and/or getting your advanced certification while visiting this wreck. The Florida Department of Environmental Protection (responsible for overseeing sinking) worked very closely w/ Monroe County to provide the safest wreck both to divers and the environment.